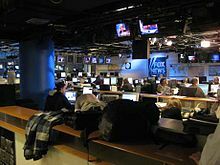 The Fox News Group produces Fox News Sunday, which airs on the Fox Broadcasting Company and re-airs on FNC. Fox News also produces occasional special event coverage that is broadcast on FBC. According to a 2013 Gallup poll, 94% of Fox viewers either identify themselves or lean Republican. ^ Umstead, R. Thomas. "Fox News Ends 2018 as Most Watched Cable Network". Multichannel. Retrieved 2019-04-04. ^ "Fox swooned over Kanye West at the White House. Here's how it covered rappers visiting Obama". Washington Post. Retrieved 2018-10-12. ^ "False claims of a coming ice age spread through ecosystem of unreliable news sites, blogs, and social media accounts". Climate Feedback. 2018-11-21. Retrieved 2018-12-22.